1993 MARVEL COMICS GAMBIT #1 CGC 9.8 EMBOSSED GOLD FOIL LOGO - AWESOME!!!! 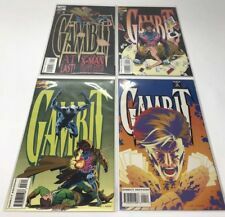 Gambit 1 Gold Variant CGC 9.6 (Dec 1993, Marvel) Rare Marvel Comic Old Label! 11 product ratings - Gambit 1 Gold Variant CGC 9.6 (Dec 1993, Marvel) Rare Marvel Comic Old Label!